We combine PhD level knowledge with decades of marketing experience to offer marketing services, inbound marketing and integrated programmes that deliver results for life science companies. Need to create your plan? Raise awareness? Capture and nurture leads? Generate sales revenue? Then get in touch. How can we help you reach your marketing and sales goals? Are you looking to bring in dedicated expertise in a specific area? Or perhaps to support your busy internal team? Maybe you need an agency to act as your entire marketing department. Regardless of your requirements, we have the service for you, including a range of traditional services, as well as our new Inbound Marketing service. If you have a specific service in mind, we can help. Our team of strategic consultants, scientific and creative writers, graphic designers and digital marketing whizzes are ready to support your team. Are your traditional marketing tactics delivering like they used to, or is it time for something different? If so, work with our inbound certified experts to attract more website visitors, convert more leads and close more customers. Need a plan? Don’t know where to start? Knowing which marketing tactics and services you require is tricky without a well-researched, strategic plan. But creating one without the right tools be a time-consuming and challenging task. 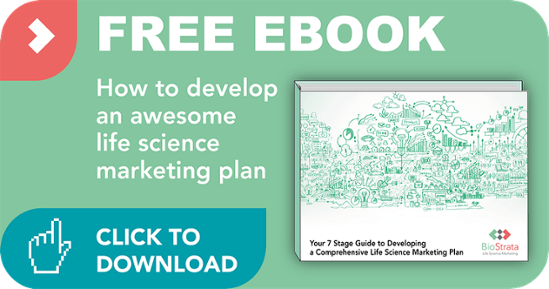 Let us guide you through our seven step process to developing a comprehensive life science marketing strategy and tactical plan that will help your business stand out from the competition, raise awareness, get leads and generate revenue. Download your FREE ebook today, we guarantee it will be the most important thing you read this year. Promise. Why should you work with us? Because we’re life science marketing specialists. The term ‘life science’ has a pretty broad meaning for us and we like to think we’re experts in all the sectors below. Click on an individual button below to learn more.